Rival explorers have beaten the Pathfinders to a valuable site in Katapesh, but fortunately most of the riches—including the obscure text the Society sought in the first place—have ended up in the capitol’s extensive bazaars. What is at first a routine shopping trip spirals out of control as the PCs uncovers the writing’s secret past—and secret messages. A strange confluence of circumstances leaves the researchers of Uringen understaffed and in need of able-bodied assistants. 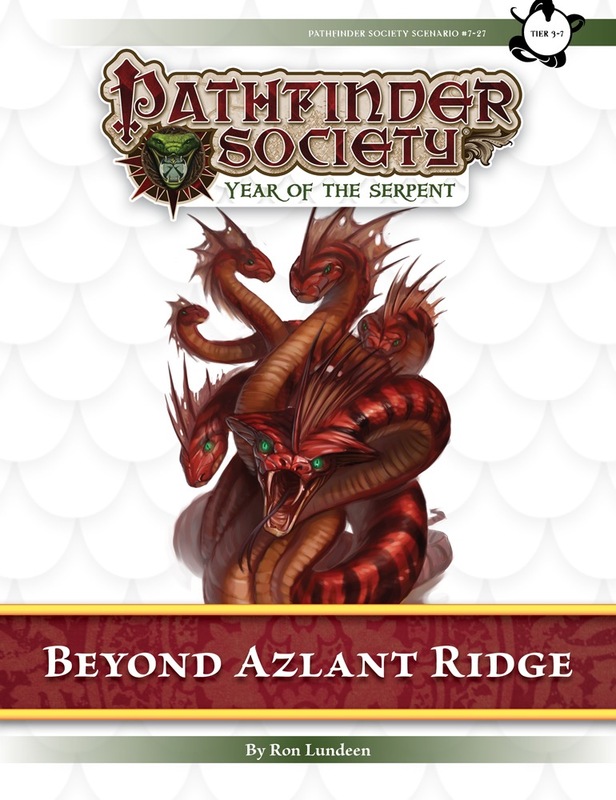 Conveniently, recent Pathfinder Society experiments call for a rare reagent found only in that area, and the two organizations have negotiated a mutually beneficial deal. Can the PCs reach the secluded settlement in time to witness this extraordinary event—and handle the phenomenon’s aftermath? 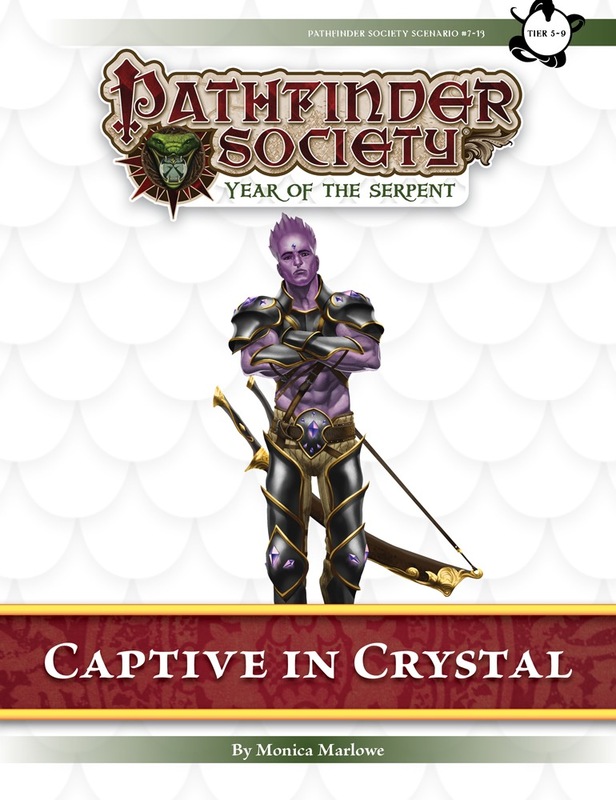 A recent assault on the Pathfinder Society has renewed hostilities with the Aspis Consortium, and clues left behind point to one of its masterminds: the gold agent Maiveer Sloan. By infiltrating one of the Consortium’s artifact-smuggling operations, the PCs can sabotage their rivals’ criminal operations and send a clear message: No attack will go unanswered. When a samsaran dies, he is reborn again with few memories of his past lives. The cycle continues until he has earned a righteous place in the afterlife. 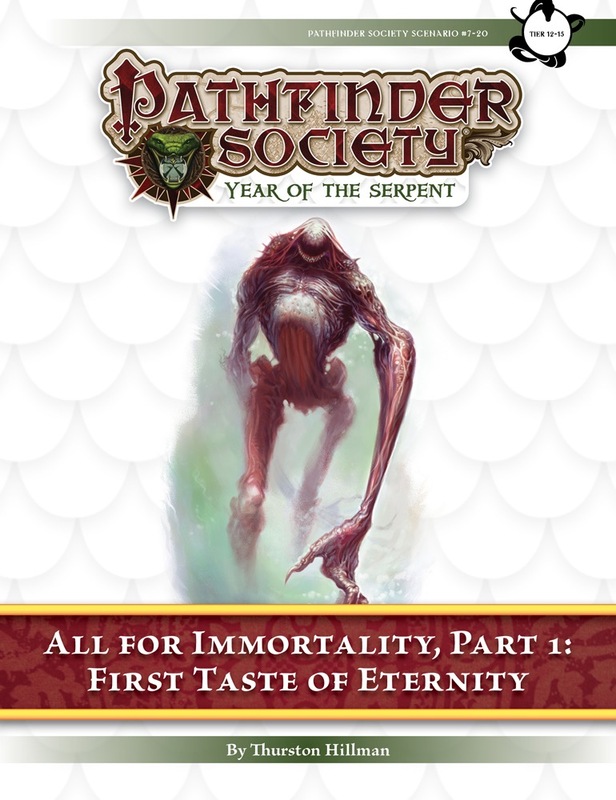 After years of service and lifetimes of accomplishment, Venture-Captain Bakten nears the end of his noble existence and has begun investigating his past lives as a means of understanding Tian Xia's rich history. However, he cannot complete his research alone, and only with the PCs' assistance can they decipher the region's past. 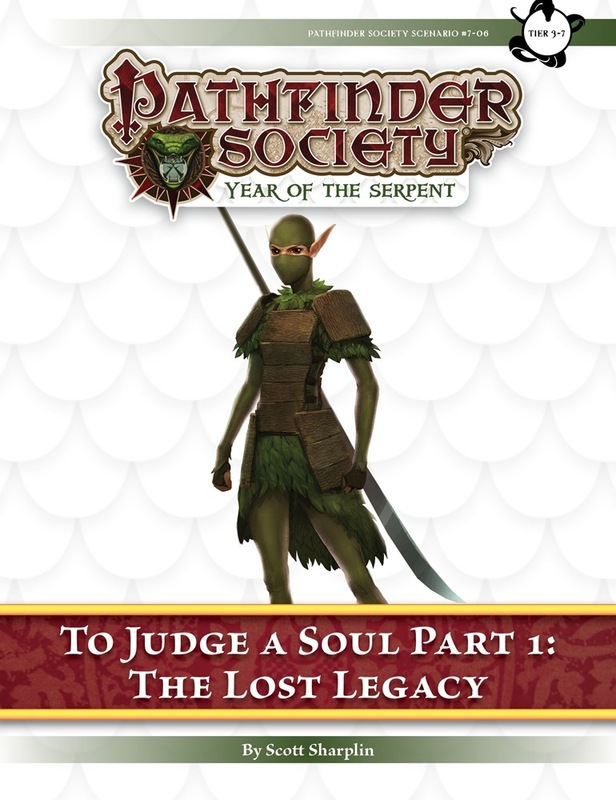 "The Lost Legacy" is the first scenario in the two-part To Judge a Soul campaign arc. 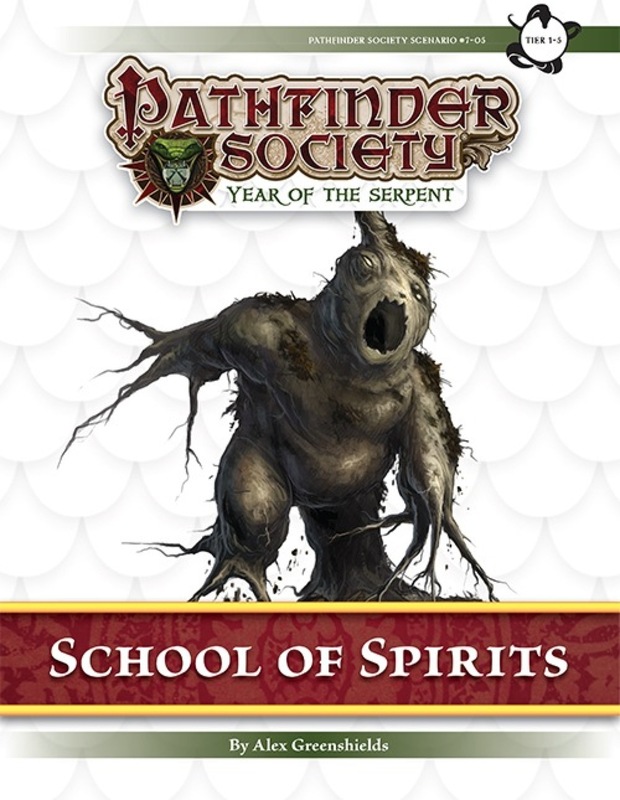 It is followed by Pathfinder Society Scenario #7-08: To Judge a Soul, Part 2: Karma Reclaimed and is intended to be played in order. 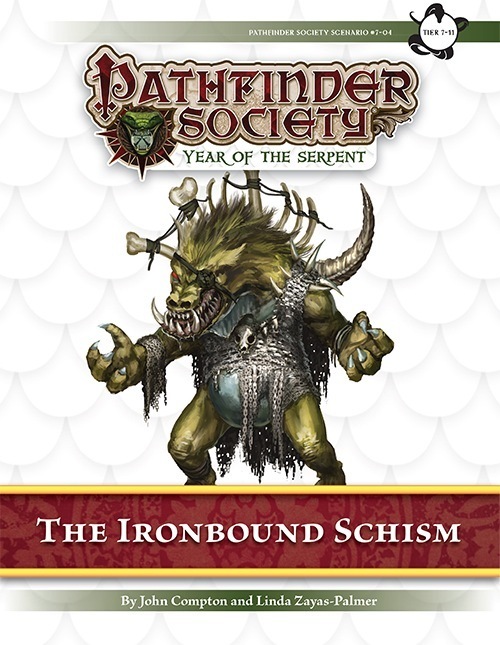 Less than a decade ago, the Pathfinder Society established a lodge in Nirmathas, an act that infuriated the nation's expansionist rival Molthune. The latter outlawed the Society soon after, and ever since Pathfinders have relied on smugglers like the Varisian entrepreneur Guaril Karela to slip supplies past the Molthuni blockade for both the lodge and the Society's war-torn neighbors. Something has intercepted those shipments. Can the PCs uncover the culprit and save the Society's reputation in Nirmathas? 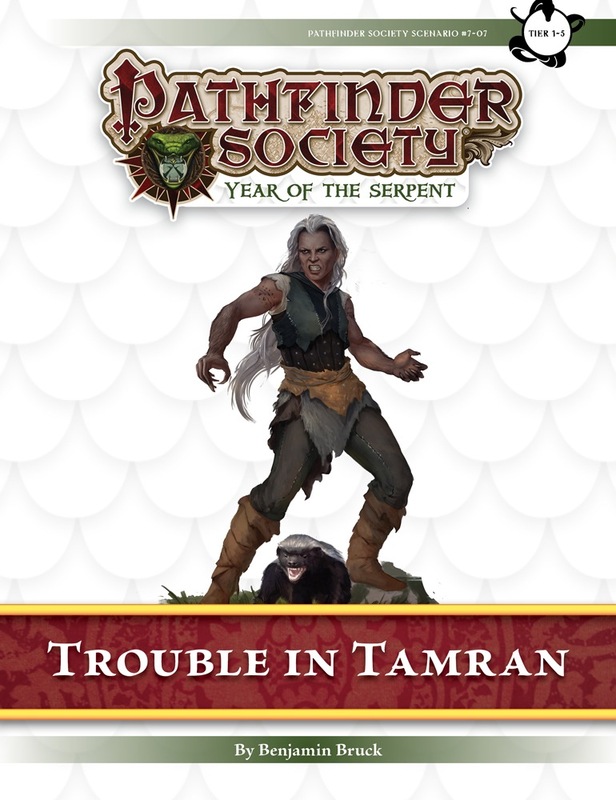 Content in "Trouble in Tamran" also ties into a special metaplot element from Pathfinder Society Special #6–98: Serpents Rise. Players who have completed that special event are encouraged to bring its Chronicle sheet when playing this adventure. Venture-Captain Bakten's past lives and the history of northern Tian Xia are interwoven, and with the PCs' assistance he has uncovered a troubling legacy secreted within the mountains of Zi Ha. It is up to the Pathfinders to ascend into the ice-capped mountains to unveil the crimes of past generations and save one of the region's greatest heroes. 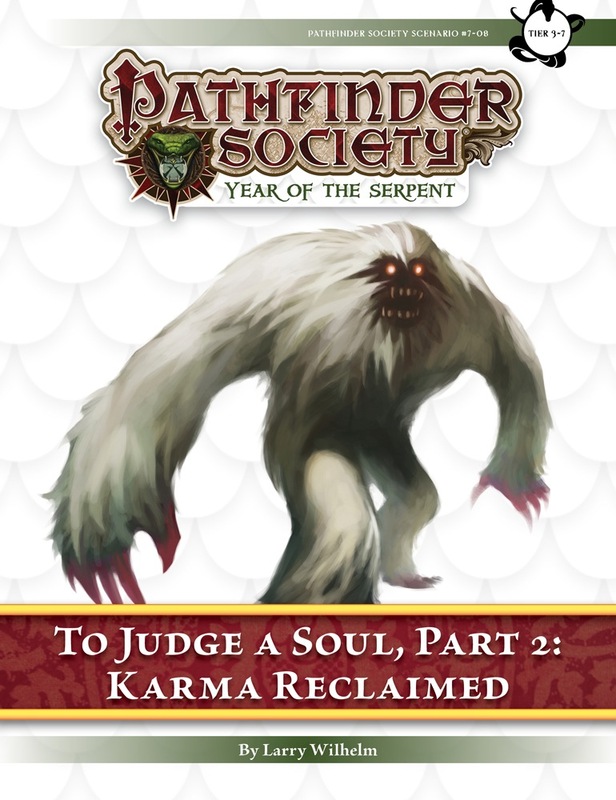 "Karma Reclaimed" is the second scenario in the two-part To Judge a Soul campaign arc. 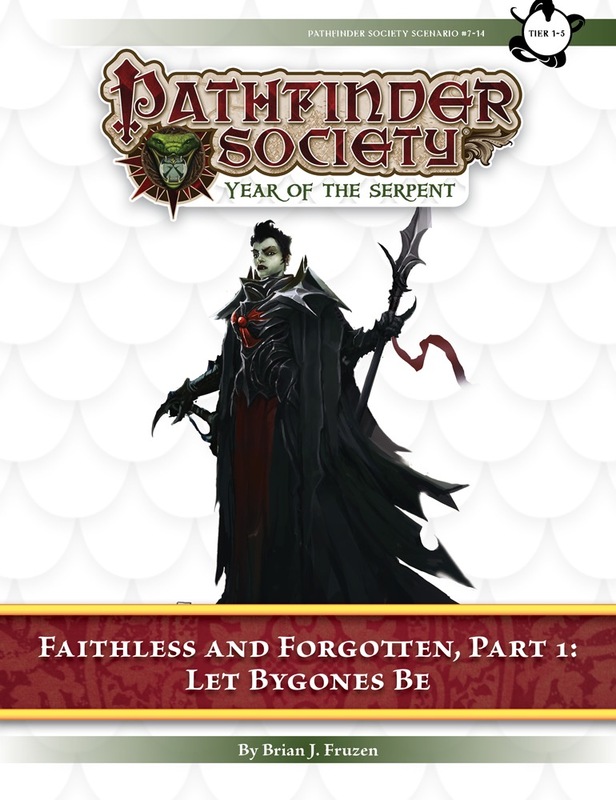 It is preceded by Pathfinder Society Scenario #7-06: To Judge a Soul, Part 1: The Lost Legacy and is intended to be played in order. A recent attack on the Grand Lodge became all the more heinous when one of the invading agents employed an eldritch relic to abduct a high-ranking Pathfinder. In order to release the captive, the Society must understand the relic and track down the fleeing operative—a mission that leads the PCs into Absalom's most prestigious archives to uncover a dark secret. 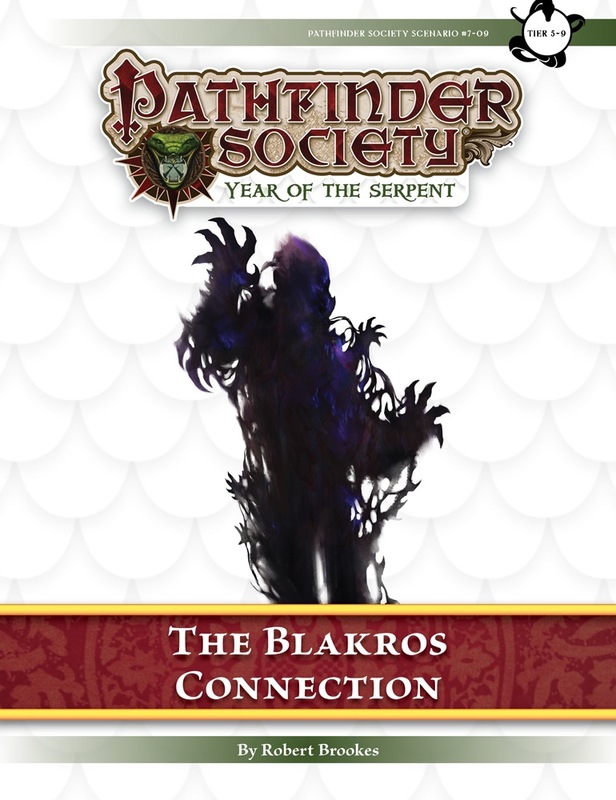 Content in "The Blakros Connection" also ties into a special metaplot element from Pathfinder Society Special #6-98: Serpents Rise. Players who have completed that special event are encouraged to bring its Chronicle sheet when playing this adventure. The Aspis Consortium pays well, but few can stand its underhanded tactics for long. 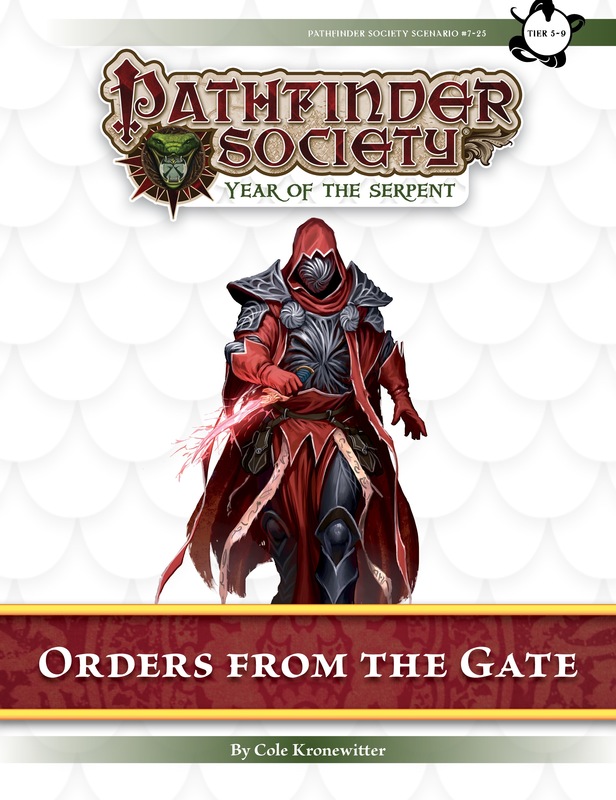 One operative fed up with the Consortium's practices has contacted the Pathfinder Society with a tempting offer: assist her in leaving the organization, and she will supply the Society with years of insider intelligence about their longstanding rival. It's up to the PCs to navigate Diobel—a proud town run by cutthroat smugglers—earn the defector's trust, and deal a telling blow to their Aspis foes. 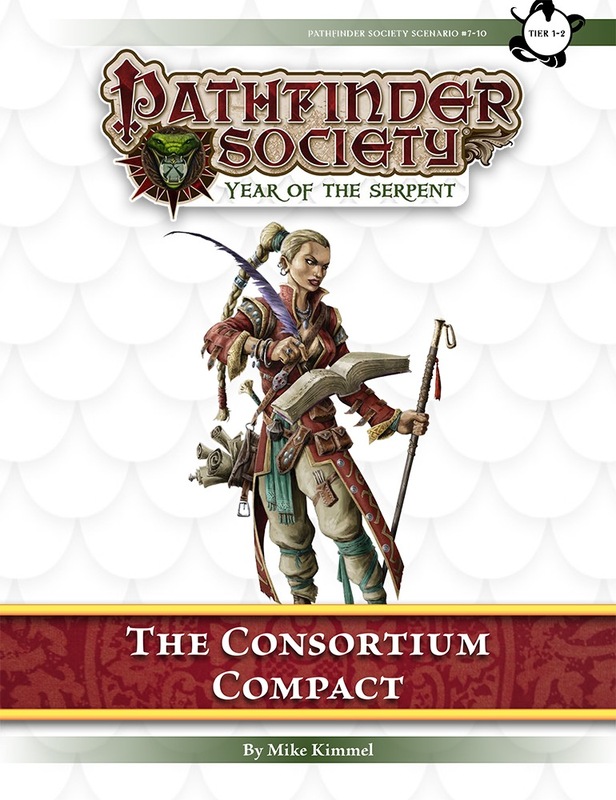 "The Consortium Compact" is an evergreen, replayable scenario designed to help introduce players to the Pathfinder Society, the Isle of Kortos, and one of the Society's longstanding rivals. 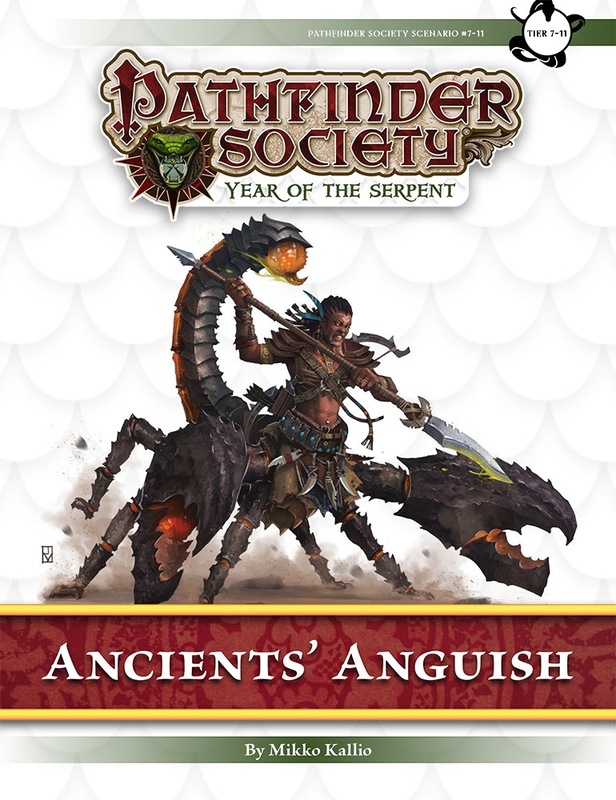 Content in "Ancients' Anguish" also contributes directly to the ongoing storyline of the Scarab Sages faction. A magical war between the archmages Geb and Nex left the landscape between their nations scarred and wracked by magical anomalies—a barren stretch known as the Mana Wastes. During the conflict, their generals also created countless weapons and defenses that pushed the limits of magic, yet most of these were destroyed in battle or lost forever. Recent investigations suggest that some of this ancient power is at play in an insular town outside Alkenstar, but there the trail runs cold. Can the PCs uncover the truth while braving the residents' eccentricities? 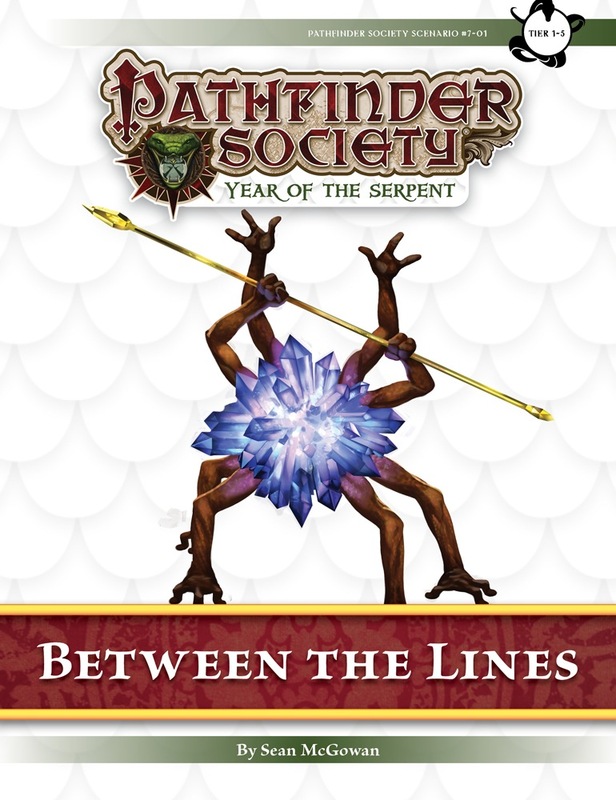 When the Pathfinder Society claimed the Hao Jin Tapestry in Tian Xia, it seemed as though the Aspis Consortium's influence there had ended. An anonymous informant recently identified an Aspis resurgence in Goka's Deepmarket, and Venture-Captain Amara Li hopes that a small, well-trained team can ferret out the villains and prevent any greater atrocities. 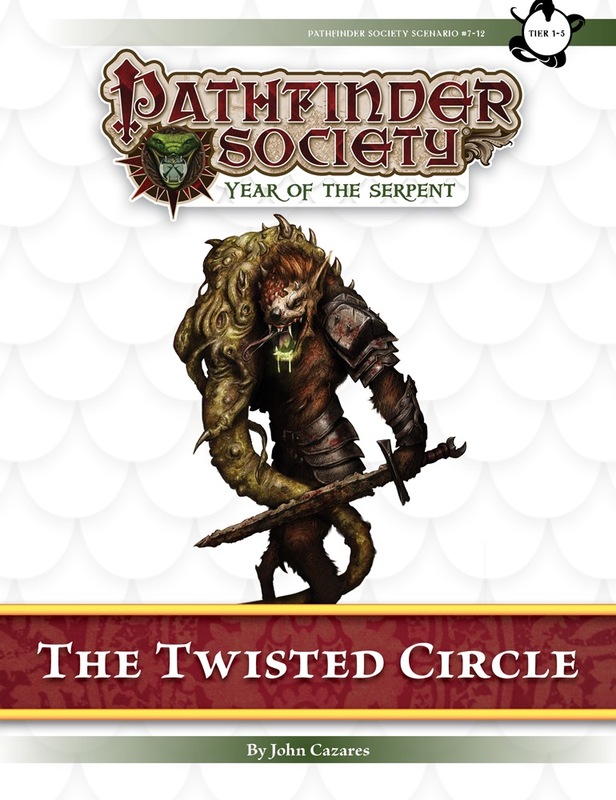 Can the PCs traverse the Deepmarket's treacherous politics and tunnels and neutralize the Consortium's local ringleader? 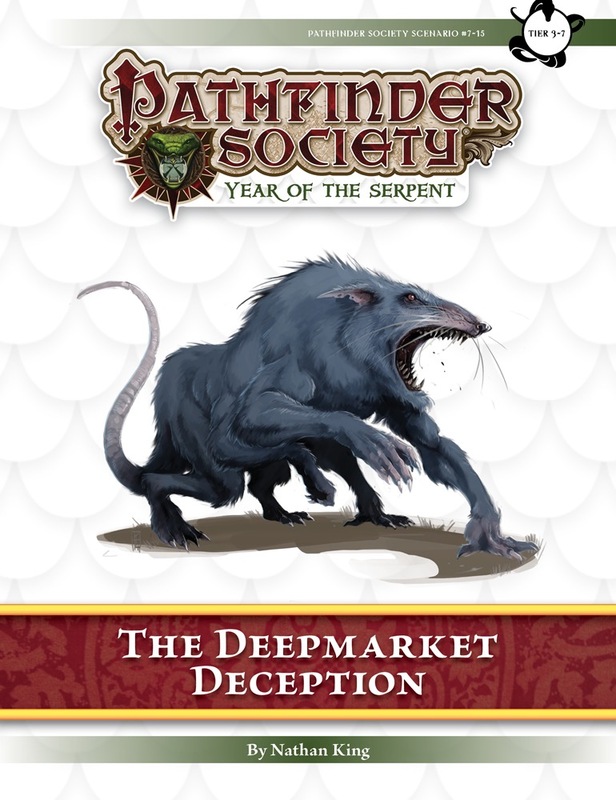 Content in The Deepmarket Deception also contributes directly to the ongoing storyline of the retired Lantern Lodge faction. The Society’s excavations continue, now taking the PCs to the long-contested territory of Kharijite—Cheliax’s southernmost territory, where the great Arch of Aroden bridges the Hespereth Strait and establishes an Avistani foothold in Rahadoum’s backyard. There, an ancient Taldan ruin suggests that empire’s great Armies of Exploration traveled even farther than believed possible. Can the PCs uncover the site’s secrets—and in doing so reshape the Inner Sea region’s history? “Lost Colony of Taldor” is the second scenario in the three-part Faithless and Forgotten campaign arc. 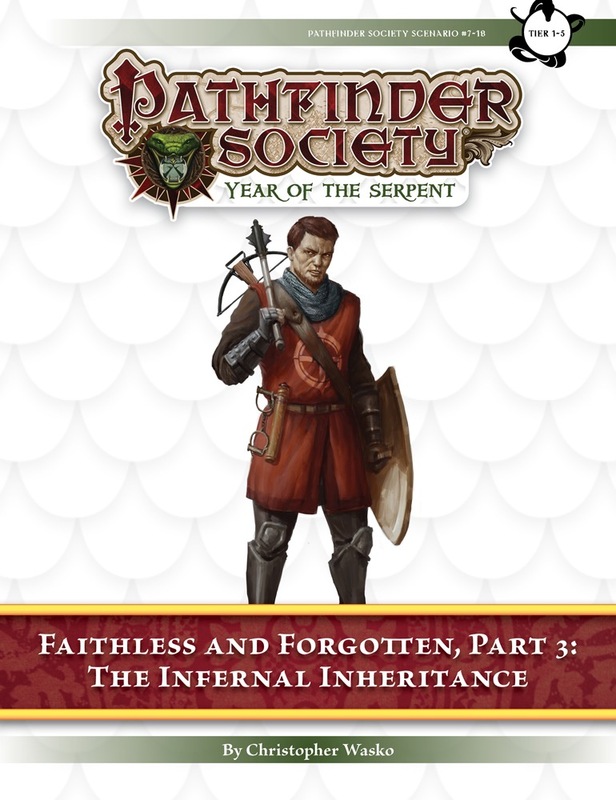 It is preceded by Pathfinder Society Scenario #7–14: “Let Bygones Be” and followed by Pathfinder Society Scenarios #7–18: “The Infernal Inheritance.” All three chapters are intended to be played in order. 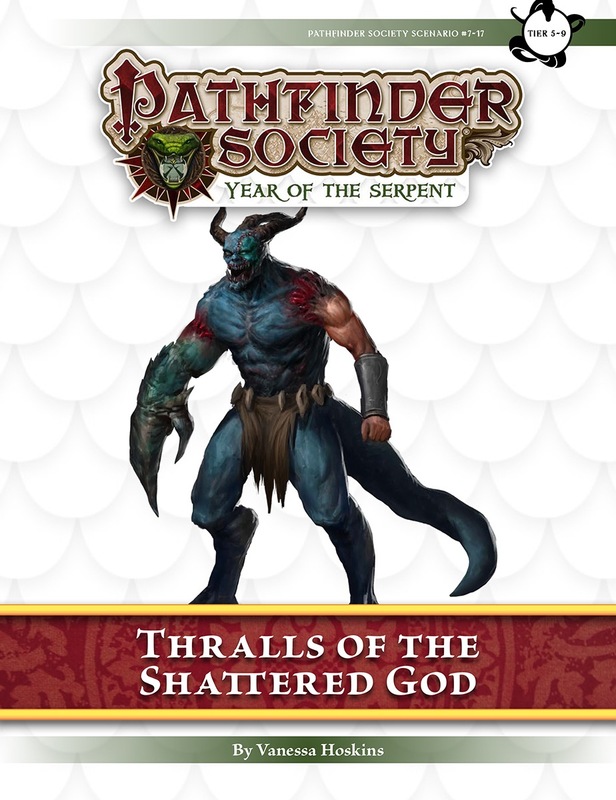 Content in “Thralls of the Shattered God” also contributes directly to the ongoing storyline of the Silver Crusade faction. Tragedy has struck, and the Society’s attention must turn from academics to action as they infiltrate a seemingly impenetrable facility in the heart of Ostenso, one of Cheliax’s greatest ports. They must act quickly, for only the distraction of a national holiday can provide the PCs the cover they need to get in, get the job done, and get out without drawing the attention of an entire city’s guards. Content in “The Infernal Inheritance” also contributes directly to the ongoing storylines of the Dark Archive and Liberty's Edge factions. Every year, one of Thuvia’s five city-states receives a mere six vials of the famous sun orchid elixir—a potent and extravagantly expensive tonic able to reverse the effects of aging. 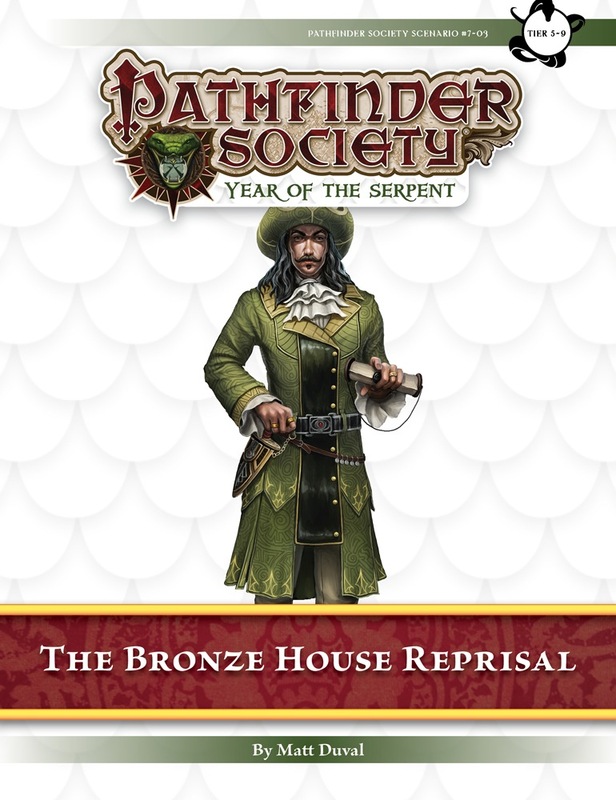 After both of his last two shipments disappeared without a trace, the ruler of Pashow has retained the services of the Pathfinder Society to ensure that this year the elixir arrives unharmed and restores prosperity to his realm. However, what begins as an unusual security assignment quickly spirals into a revelatory unveiling of Pashow’s treacherous underbelly. With the power to vastly extend life, the sun orchid elixir is one of the most prized items in the Inner Sea—and as a result one of the most dangerous to transport. After his shipments of sun orchid elixir vanished without a trace two years in a row, the ruler of Pashow is desperate to ensure that his next delivery goes off without a hitch. In order to test its security, Pashow has hired a team of Pathfinders to execute their finest heist and test the convoy’s defenses. Are the PCs up to the challenge? 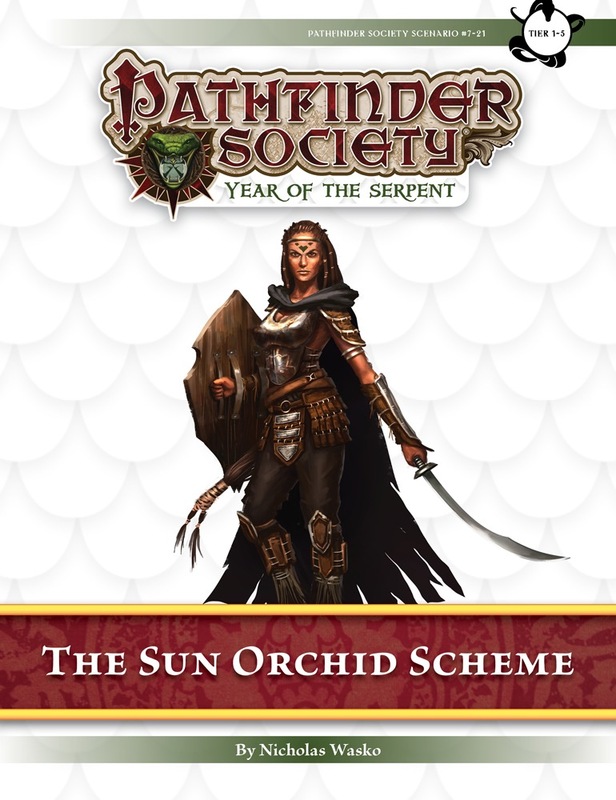 Content in “The Sun Orchid Scheme” also contributes directly to the ongoing storyline of the Sovereign Court faction. 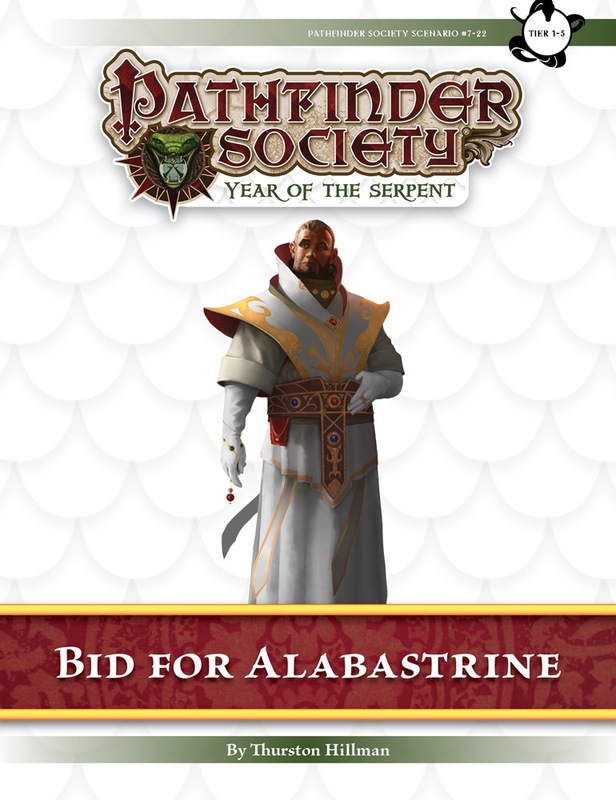 Content in “Bid for Alabastrine” also contributes directly to the ongoing storyline of the Exchange Faction. 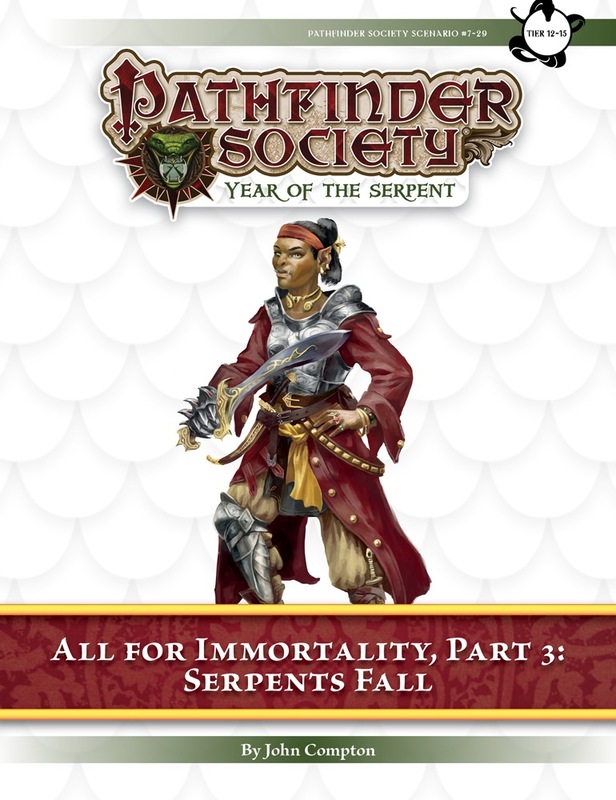 Content in this scenario also ties into a special metaplot element from Pathfinder Society Special #6–98: "Serpents Rise". Players who have completed that special event are encouraged to bring its Chronicle sheet when playing this adventure. 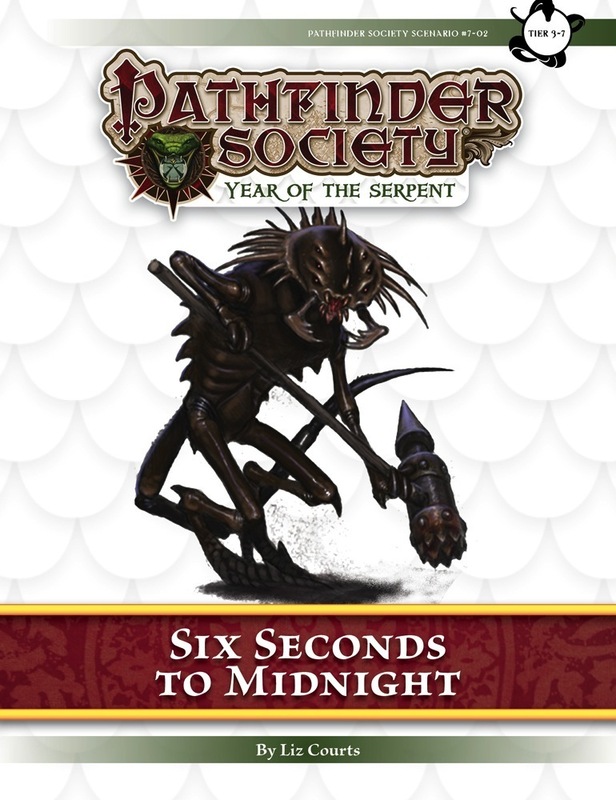 Among the greatest crimes committed during an attack on the Grand Lodge was the abduction of a high-ranking member of the Pathfinder Society. 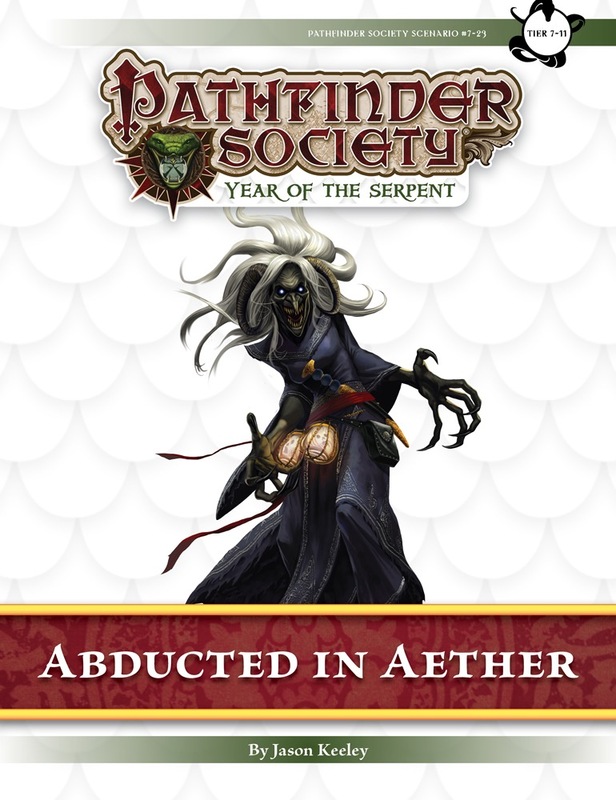 The Society has tracked the kidnapped to another plane of existence, where his captor is preparing to sell her prize to a host of otherworldly bidders. 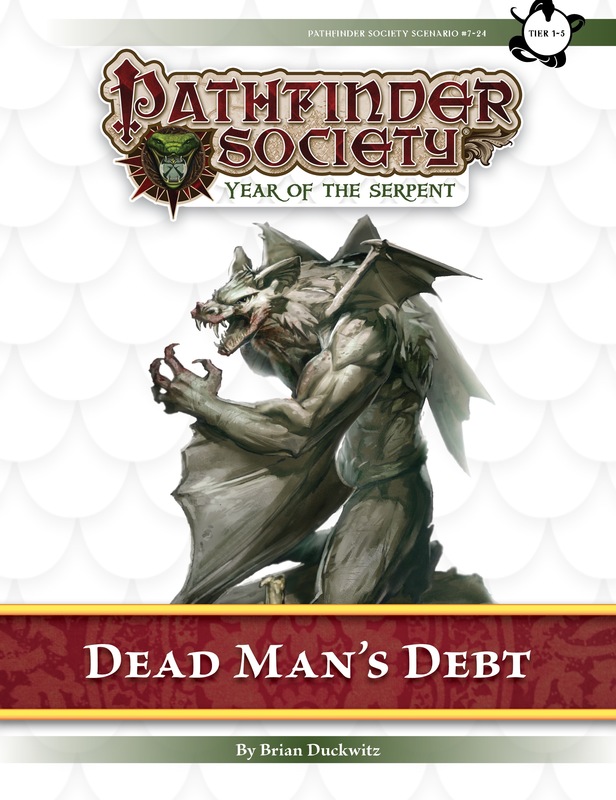 Can the PCs intervene and mount a rescue before the esteemed captive disappears forever? Content in “Abducted in Aether” also contributes directly to the ongoing storyline of the Grand Lodge faction. Recent revelations suggest the Thuvian crisis is part of a more devious scheme—one that extends far beyond the sun orchid trade. 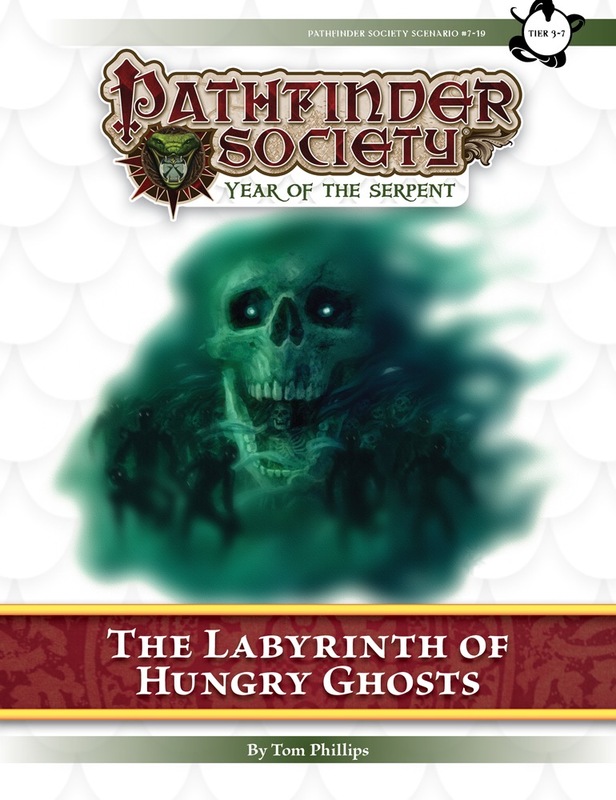 On the trail of the villainous mastermind at the heart of it all, the PCs set out for shadow-cursed Nidal to infiltrate a clandestine facility established to study the utterly otherworldly. 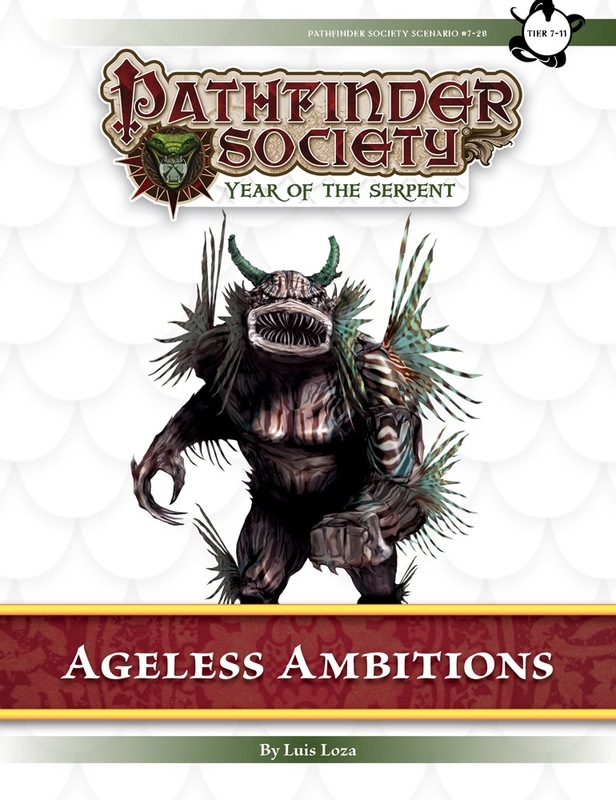 Content in “Ageless Ambitions” also contributes directly to the ongoing storyline of the Sovereign Court faction. 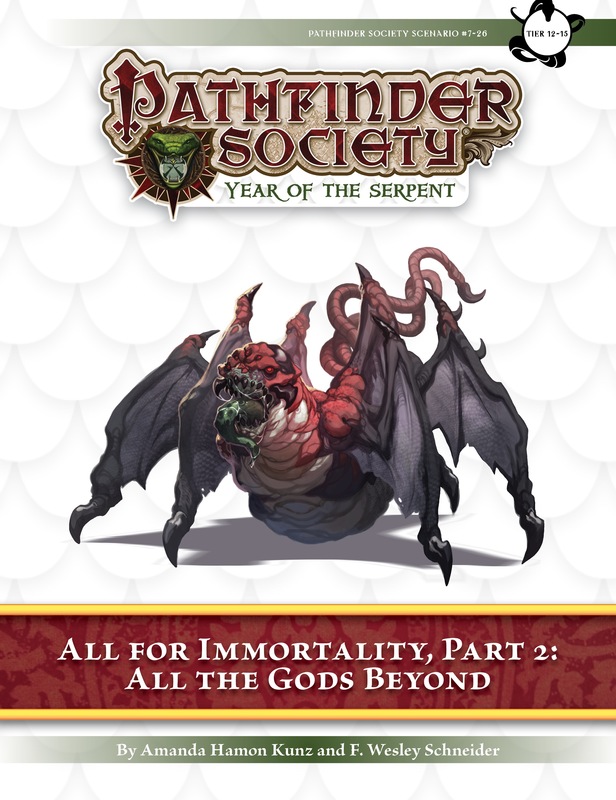 Content in this scenario also ties into a special metaplot element from Pathfinder Society Special #6–98: "Serpents Rise." Players who have completed that special event are encouraged to bring its Chronicle sheet when playing this adventure. The elite Pathfinders have unraveled secrets within secrets, all of which point to a mastermind poised to strike from the Chelish military port of Ostenso. Sending agents so deep into enemy territory risks brutal reprisal, yet it cannot compare to the evils that will arise if the Society does not intervene. There is no recourse but to strike at the very heart of the Aspis Consortium itself, and the PCs shall wield the blade!